This week I'm thinking about Josep Coll's cartoons for the leading Spanish children's humor magazine TBO. His first drawing for the magazine was in 1949, by which time it was already a venerable institution, first published in 1917 and lending its name to the Spanish slang term for comics which heads this paragraph. His work continued to appear there until his 1984 suicide, although he quit comics for a decade to work in construction, which paid better than being one of the foremost cartoonists in the country. Unlike the majority of its rival comics magazines, TBO featured few recurring characters, focusing instead on one-off gag strips that could be easily recycled when a gap needed to be filled. Coll in particular seems never to have even attempted an ongoing character: his fluid, graceful line, which early on owed something to such stylists as Caran d'Ache and H. M. Bateman, but by the mid-1950s was thoroughly his own, was better suited to the deadpan presentation of imaginative action than to the creation of the sort of grotesques that were popular in the Bruguera magazines. What follows is a selection of Coll cartoons from the year-end "Almanaque" editions of TBO between 1954 and 1977: super-sized compilations of cartooning which may or may not have been reprinted from the previous year. I'm mostly leaving out cartoons which depend primarily on verbiage to be understood: Coll was an excellent writer, snappy and idiomatic, but he communicated even more effectively through the representation of time by the intelligent application of space: in other words, through comics. 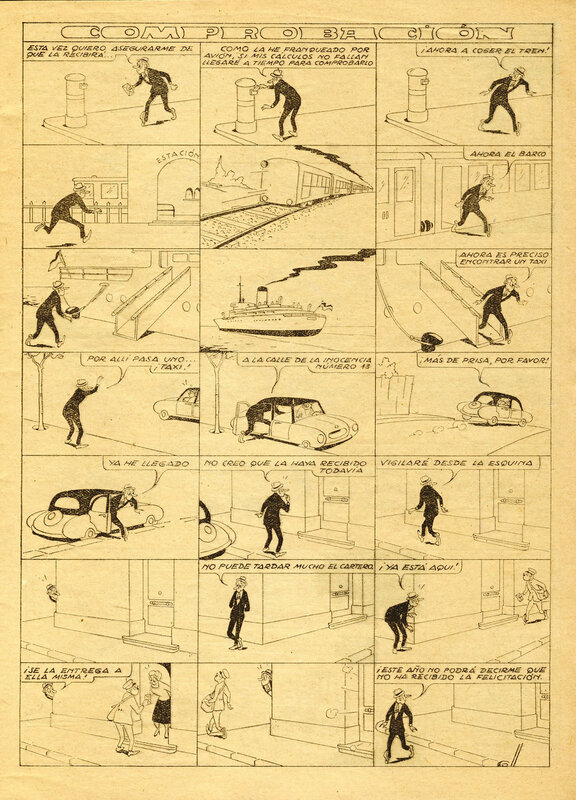 This is obviously only a miniscule sampling: like most midcentury cartoonists, Coll was immensely prolific, with at least one strip in each weekly issue of TBO, as well as scattered work in other magazines between the late 40s and the early 70s, and a bit more sporadically until his death. And like many artists, he only improved with age; his strips of the 1980s were as sharp and funny and elegantly-designed as anything cartoonists half his age were publishing in the satirical, underground, and auteurist magazines of the decade.